My mom has always been a stickler for mashed potatoes being freshly made. I have to 100% agree with her on this and can tell instantly when they are not fresh! I guess you could say she “spoiled” me on the real thing, but I am definitely okay with that. 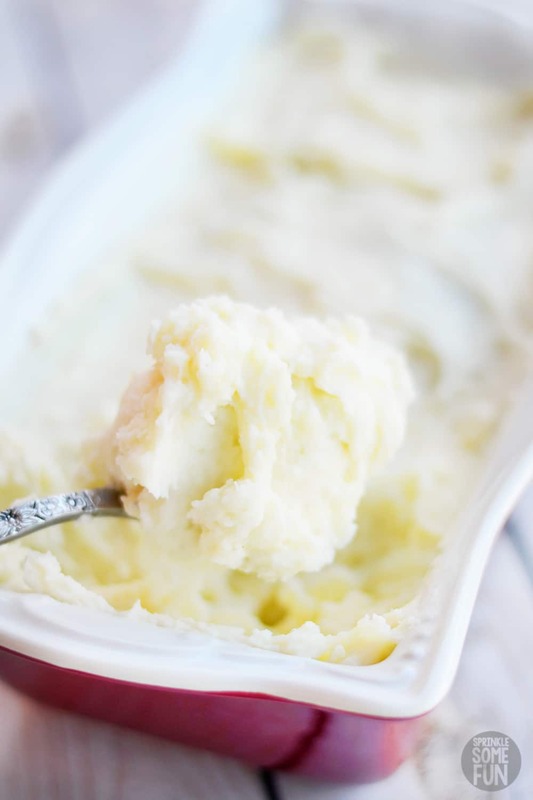 My mom’s whipped potatoes are the creamiest and most delicious mashed potatoes ever! 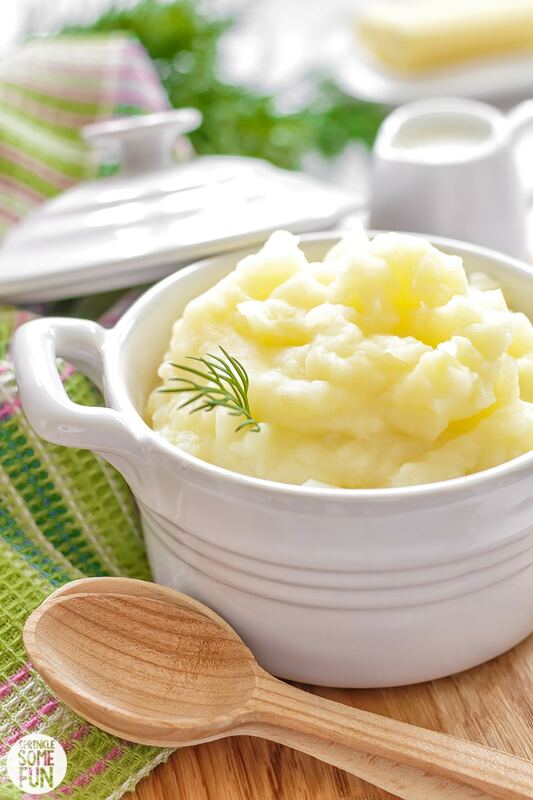 This may be the only Mashed Potato recipe you will ever need. My mom makes these potatoes for nearly every pot luck and she always gets rave reviews. People are always asking, “How did you get them so creamy and fluffy?”. The answer is pretty simple; she whips them with her mixer instead of mashing them! Just be careful; you may end up being the designated mashed potato maker for every get-together if you make these. Whipping makes them impossibly light and creamy. It’s also much easier and time efficient than mashing. It’s a win-win! 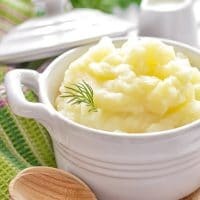 These mashed potatoes are a great basic recipe that I can always count on to turn out great. Of course you can make these potatoes fancy by adding some cheese or whatever you want, but these potatoes make a great base to any recipe calling for mashed potatoes. I think everyone that has tried these can agree with me that these are excellent without anything extra. Start with potatoes peeled and quartered. Make sure the size of the potato cuts are as even as possible so the potatoes cook evenly. Use the wire whip attachment if your mixer has different attachments like the Kitchaid does. My mom and I both have a Kitchenaid mixer and it makes the best whipped potatoes. I have both a hand held Kitchenaid mixer and a Kitchenaid artisan stand mixer. They are both great! Find a Kitchenaid mixers (affiliate) here. Use real butter instead of margarine. 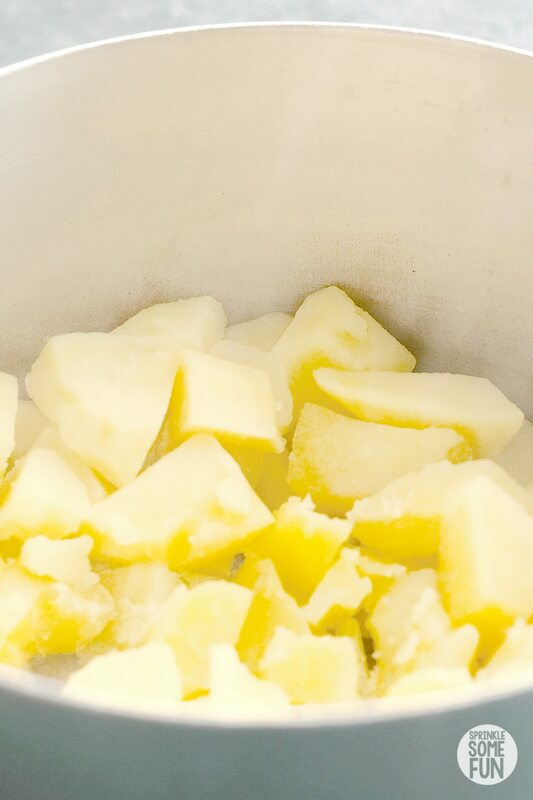 The best and creamiest mashed potatoes are made with real butter. Butter also adds the flavor for this dish. A splash of heavy whipping cream can be a nice touch too, but the butter is essential. Add the butter while the potatoes are still hot. The butter should melt right into the hot potatoes! Don’t over-whip the potatoes. Make sure to stop whipping once the potatoes are smooth. Over whipping can sometimes lead to a “gluey” like texture. I suggest using Russet or Yukon Gold Potatoes. These are our favorites for the most buttery and fluffy mashed potatoes. My mom always made her whipped potatoes in a pressure cooker. Since the Instant Pot is a safer/easier way to pressure cook and it’s the way that I am using from now on. 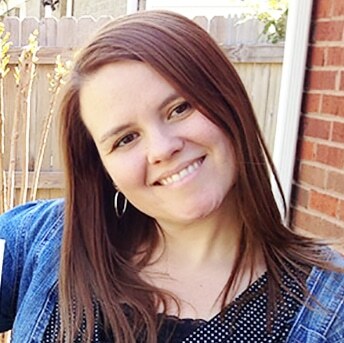 Find an Instant Pot (affiliate)here. Use high heat and the quick steam release. This will help to ensure that the potatoes are not over-cooked. Once the pressure is fully released, take the lid off and let cool for five minutes before draining. Make sure the potatoes are cooked until tender. A fork stuck through the middle of the potatoes should be easy. If they are still too hard then pressure cook for another five minutes. I’ve never had this problem, but I am sure that each Instant Pot could be different. Fully drain the potatoes. 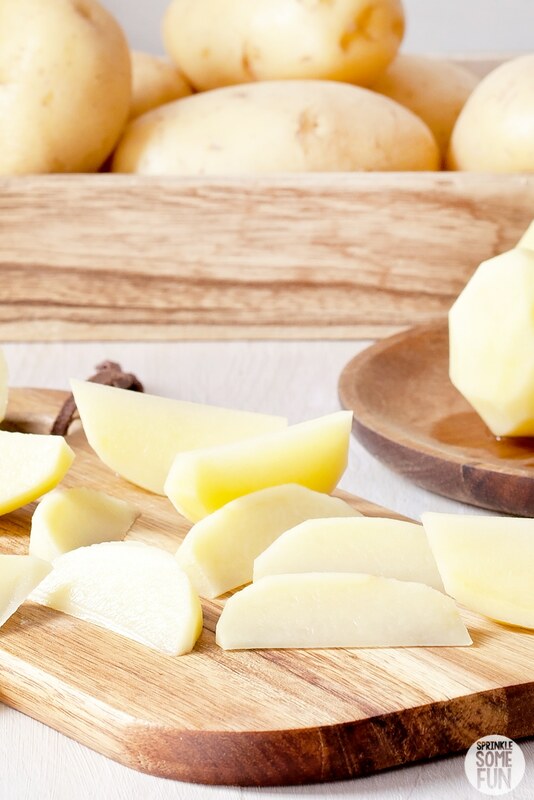 The potatoes should not have much water left before mixing because the starchy water will possible make them too gummy. We don’t want gummy! We want creamy, fluffy and dreamy mashed potatoes. I like to transfer my cooked potatoes into the stand mixer, but you can whip them in the instant pot bowl too. The biggest problem with whipping them in the Instant Pot Bowl is that the bowl will be hot to the touch. Wear protective gloves and protect your counter if you whip it in the Instant Pot bowl. If you follow my mom’s easy steps, you’ll get perfectly creamy delicious whipped potatoes every time. Mashed potatoes are a simple comfort food that goes with just about anything. My favorite way to eat them is with turkey gravy on Thanksgiving! 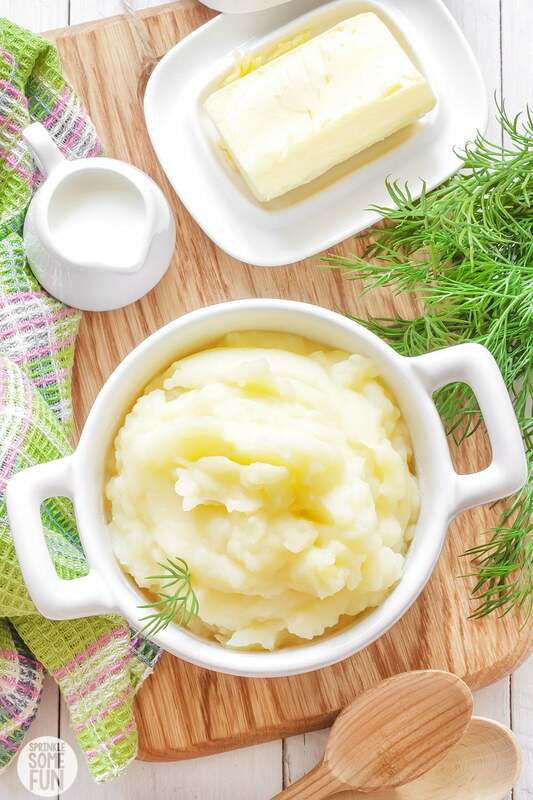 What is your favorite meal with mashed/whipped potatoes? 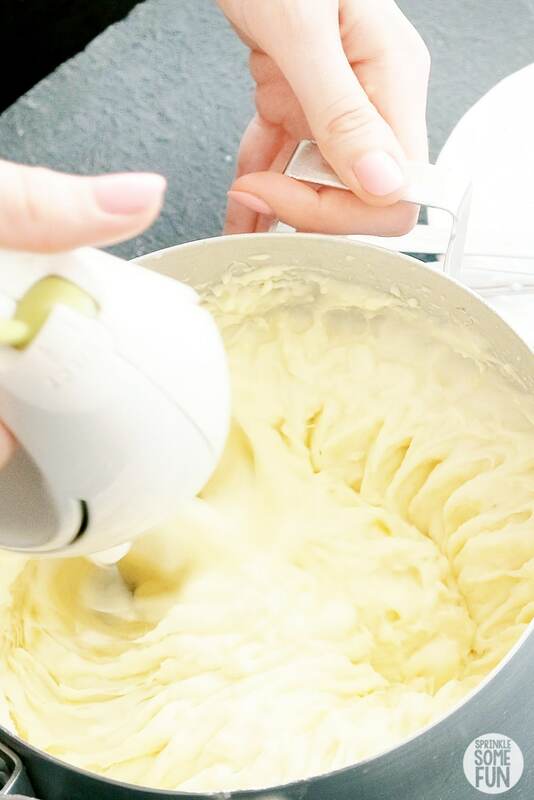 Have you ever tried whipping them in a mixer or with a hand mixer? It’s my favorite way to prepare them and so much easier than mashing them by hand. I hope you enjoy this favorite “heirloom recipe”! If you LOVE these whipped potatoes as , please give us a five star review below. Also, be sure to share your winter wreath creations on Instagram and tag me #sprinklesomefun so I can see it! Whipping potatoes makes this dish impossibly light and creamy. It's also much easier and time efficient than mashing by hand. It's a win-win! 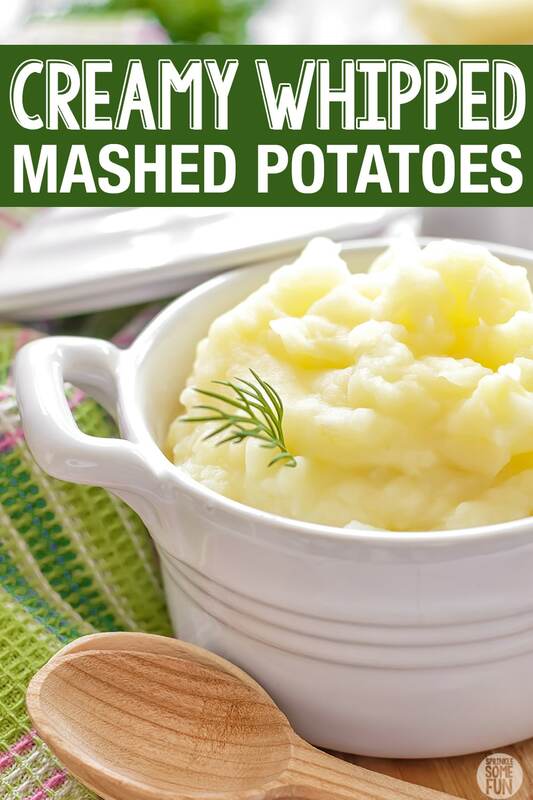 These mashed potatoes are a great basic recipe that I can always count on to turn out great. Directions using Instant Pot: Pressure cook the potatoes with 1 cup water on high for 10 minutes. Release pressure. Let it sit for 5 minutes then cool the pressure cooker down with water then open and drain off water. Potato hunks are good. You don't want the potatoes too mushy before the next step. If you don't have a pressure cooker then boil the potatoes with water that covers the top of them until they are fork tender. Transfer drained potatoes into your mixing bowl. Mix on high with the butter and 1/2 cup of milk. Add more milk until you get the consistency you want. Add salt and pepper to taste. Enjoy! Oh my, I love hot, creamy potatoes with almost any meal. I think your mother and I would get along just fine! Me too! 🙂 Thanks for stopping by, Maureen! Happy Holidays!